Salesforce users work with forms day in and day out, whether they are salespeople, admins, or managers. Being able to seamlessly add, edit, and delete information is a key driver of productivity. Improving this experience is one of the UX team’s goals with the new Lightning Experience. 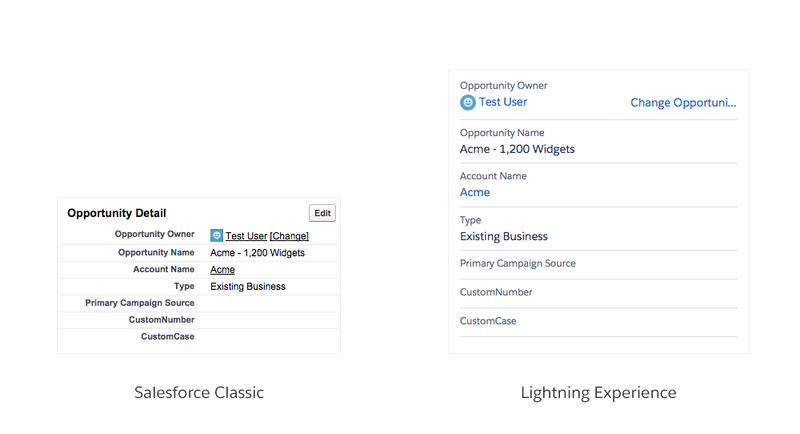 In Lightning, forms are displayed with labels placed on top of their respective input fields. 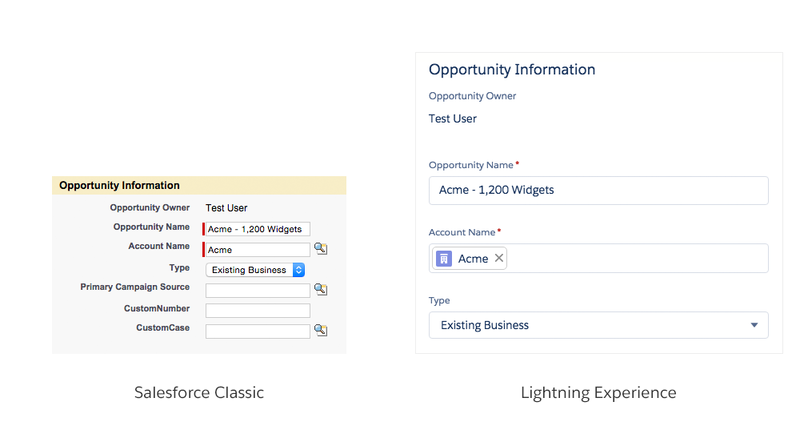 Top-aligned labels are efficient in that they “only require a single eye fixation to take in both input label & field.” Take a look at editing in Salesforce Classic UI and the new Lightning Experience below. While the new design does take up more vertical space, the label/field pairings are much more clearly delineated in the new design. The user can scan the information top to bottom, rather than left to right to left (new line). We applied the same principles to the view mode to improve the hierarchy and legibility of the information. Looks fairly straightforward, doesn’t it? But let’s take a look at this a little more closely. 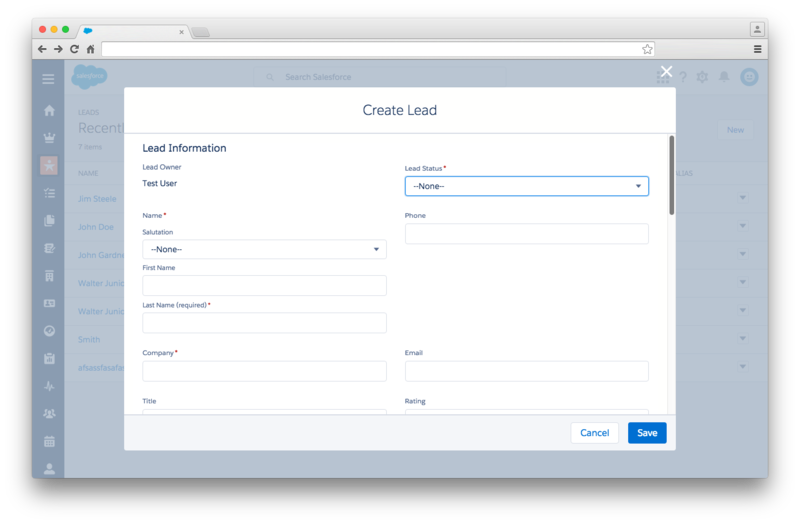 The first editable field in this form is “lead status,” which has the following options: none, contacted, open, qualified, unqualified. Now, any time someone creates a new lead, the status is set to “open” by default. Modifying this choice architecture seems small and it might save one or two seconds per person, but imagine the cumulative savings for an organization with hundreds, or thousands of people. It adds up. In an ideal world, users will diligently fill out all the fields with detailed, relevant information. In the real world, users don’t. In an ideal world, users will diligently fill out all the fields with detailed, relevant information. In the real world, users don’t. Every additional field presents another barrier to the user. To counter this, we design a compromise: the system pre-fills some key information contextually. Doing so removes potential barriers to completing the form, since the user now only needs to fill out two fields instead of four. The new Lightning Experience is designed and built with accessibility in mind. Users can trigger editing and change every field using only the keyboard. Additionally, each form component is built with a specific keyboard interaction pattern, following the W3C’s Authoring Practices for Design Patterns. All the aforementioned points are not just good for accessibility, however. Power users, who tend to use keyboards heavily, also benefit from a consistent keyboard experience. A power user can easily tab through the fields and make necessary edits, all without lifting their fingers off the keyboard. 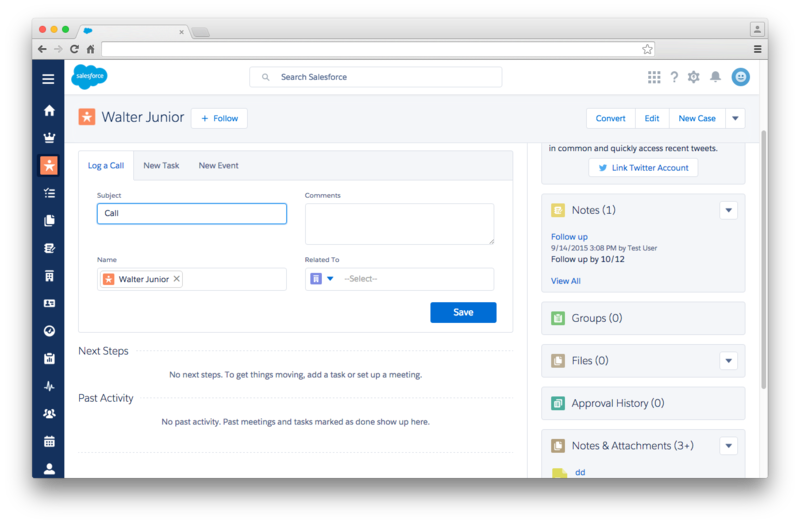 The Lightning experience is a major milestone for the Salesforce UX team, but it’s far from the end. We continue to improve the Edit experience, which includes bringing Inline Edit into Lightning. Regardless of your role, you probably have had to work with forms in some way, shape, or form — whether it’s as simple as a checkbox on a Terms of Service page, or as complex as a CRM web application. Forms are inevitable. They’re particularly essential in enterprise applications, where users interact with them for hours each day. Any gains in efficiency will be significantly magnified. As a product designer, this is a major opportunity to help your users — while designing forms, think about the contexts in which users interact with them. Craft your designs to suit those experiences. Remember that well-designed forms aren’t just pretty. They’re also clear, accessible, and efficient. Thanks to Jina Anne and Ian Schoen. Product/UX designer. Currently @medium, formerly @SalesforceUX. Urban planning & transportation enthusiast. Recording artist (ok, not really).